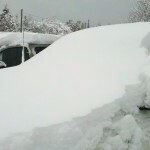 The winter of 2011-12 will probably go down in history as the winter the Snomads set a record with ride cancellations. 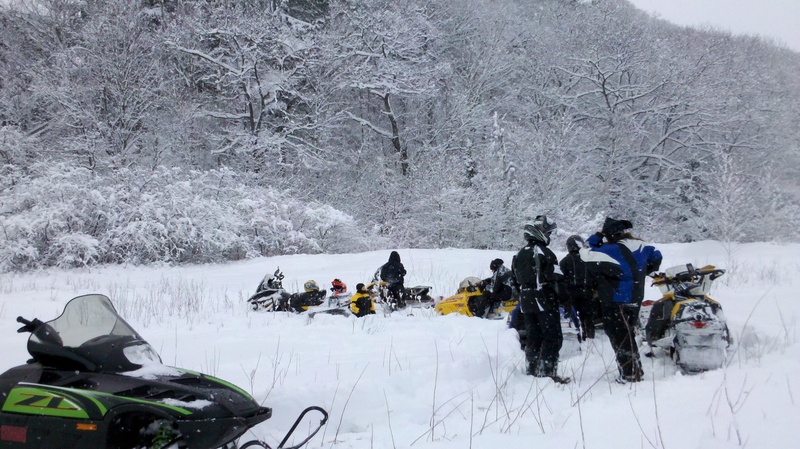 It started with the Shakedown Ride and continued on and off for most of the season. Seeing an opening the first weekend in March I decided to put together my first ride. I chose St. Ignace as Mary the kids and I had been riding out of there several times a year and really enjoyed the area. After many phone calls and planning the ride was set for March 2-4 with the Snomads staying at the Budget Host Inn overlooking Moran Bay. The winter continued to be hit and miss as 2 weeks prior to the ride Mary and I were saddle bagging the Keweenaw and it was the worst snow I’ve seen there in 10 years. 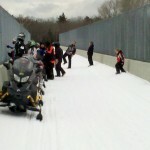 The St. Ignace ride was in danger of being cancelled and joining the long list of Snomads rides that had been shelved. The week before the ride John Dee was calling for some system snow and it hit on Tuesday with 6 heavy inches which made riding from the hotel possible. I had spoken to some people I know on the internet that had ridden out of St. Ignace the week before, and they said it was great riding except in and out of any town. Neil the VP for the Straits Area Snowmobile Club that grooms the area, and doing a fantastic job stated the same thing. He also put some pictures of the trails up on their web site. The ride was a solid go! We had the truck ready and I had spoken with Lou Kelsey a long time snowmobile buddy and new member to the club. He stated he was in, and bringing 2 guests. Rick Campbell also stated he was heading up after work and was bringing Danette Bertovich and a guest, with her snowmobile which he had just finished working on. Mary, Jacqueline (JJ), Johnathon (Buddy), Jacob and I left home about 4:30 PM on Thursday. John Dee was calling for another bigger storm with totals in the 20 inch range over the weekend so things were looking good. We arrived at the hotel before 10 PM and unpacked. Carl Schiele was the first Snomad at the hotel and stopped to say hi and get briefed on the weekend activities. 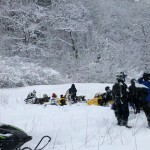 After the ride Carl was headed to Houghton to be a judge for the Clean Snowmobile Challenge at Michigan Tech. Everyone but Danette who arrived late made it to the room and got a brief idea of the plans and was advised we’d have a riders meeting at 830 am and be ready in the parking lot by 9 am. Friday morning at breakfast I spoke to Danette whose guest Jason Steele of St. Clair had to get a rental that couldn’t be picked up until 9 am. Lou Kelsey came in with his guest Kevin Cornman of Roseville. Kevin had his own sled but Lou’s other guest Mandalln Ford of Eastpointe had to get a rental that also couldn’t be picked up until after 9 am. This would be Mandalln’s first time on a snowmobile as she is from Las Vegas. I made arrangements with Lou and Danette to get the rentals and meet us at the Trout Lake Trading Post. At just after 9 am we headed out, less the group trying to get the rentals. Mary had Jacob in front of her and JJ behind her on the GTX 3 up. Buddy rode in front of me. There was good snow in town with no bear spots. When we got to the main trail by the Little Bear Recreation Area John and Geri Griffin were waiting for us. 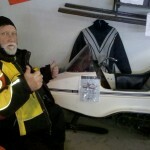 John is a past MSA president and he and Geri are both big supporters of snowmobiling. We headed out after some quick introductions and hello’s on trail #2 north which was perfect. We made it to Trout Lake in great time and stopped at the Trading Post to fill up with fuel and wait for the rest of our group. The wait turned out to be almost an hour with some issues at the rental places. Once we were all together we all headed out. The ride was great up to Shirley’s Happy Hour in Hulbert were we had lunch with the deer. If you’ve never been to Shirley’s she feeds the deer in the area and usually has 100’s in the back of the restaurant. After filling our bellies we turned and headed back toward the Hotel. On a trail side stop while talking with John Griffin I mentioned I had never seen the bridge that he had helped get put in over I-75 north of St. Ignace. He knew a back route there and would lead us if we wanted. Everyone in the group liked the idea and we were on the way. The bridge ride was one Ron Schroeder would have been proud of, but Bill Chatfield would not have, as no saws were used in getting to the bridge. The bridge was pretty impressive and made the old along the road side crossing over I-75 on M-134 a memory. 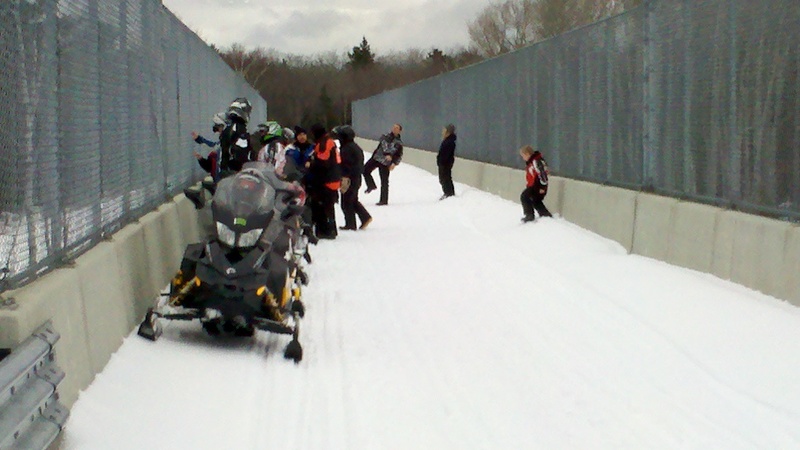 The new crossing allowed snowmobiles to cross 20 feet above the traffic on I-75. Jacob was so proud when he got 3 horn honks from the semi trucks going under the bridge headed toward the Soo. We jumped on the trail and headed back toward the hotel picking up trail #2 just north of Moran. We headed south and stopped at the BP along the trail in Moran to refuel and noticed a few bare spots on the trail. While filling up it started snowing lightly. A car stopped and the driver asked where we were heading and when I said St. Ignace they advised it was snowing hard there. 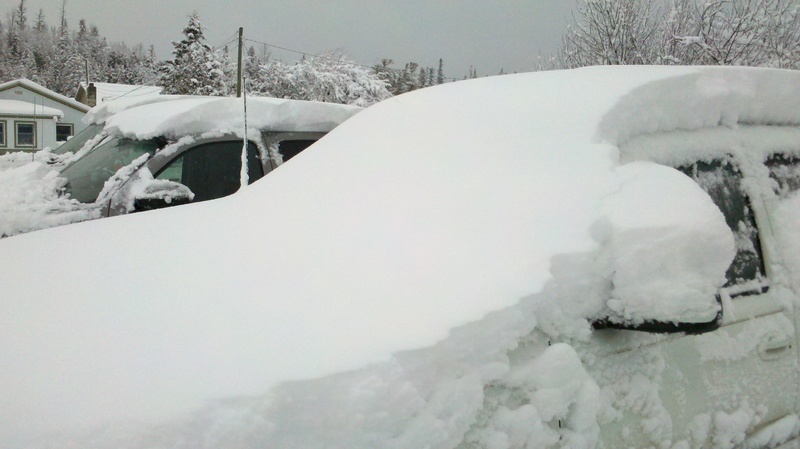 We made quick work of the 8 miles to St. Ignace and the snow continued to get stronger the closer we went. John and Geri pulled off by the Recreation Area to load up and then meet us at the hotel. Danette, Jason and Rick went to return his rental sled. The rest of us headed back to the hotel. In the parking lot it looked like there were 2 plus fresh inches of snow. We ended up covering just under 160 miles for the day. John and Geri came back and changed in our room before heading home to Cedarville. It was snowing hard by now and they had to get back for a house closing that Geri had early Saturday morning. We headed to the pool for a quick swim and relaxing hot tub before dinner. Most of the group walked down to the Driftwood Hotel and Restaurant 3 blocks south of the Budget Host for dinner. The snow had continued and was getting much heavier as the night went on. Over dinner we talked about the day’s ride and tomorrow’s plan which was the Top of the Thumb Snowmobile Museum in Naubinway. After dinner we walked back to the hotel and could barely see the tracks we had made an hour and a half ago due to the heavy snow fall. The snow was very wet and heavy system snow, tomorrow would be a great day of riding. We awoke Saturday to about 16 inches of new snow at the hotel. Jason had had enough and wasn’t riding today as were Mary, who had pneumonia, JJ and Jacob. Mary and the kids had alternate plans. The rest of us headed out on a pillow of heavy snow. We ran up the rail grade trail #2 out of St. Ignace then went northwest on #471. This is a fun trail with many sweeping corners. The snow was heavy and there were several trees over the trails. I almost felt sorry for Buddy as the snow was constantly coming over the hood of the snowmobile turning him into a snowman. At every stop he shook off all the snow he could. Just past the Brevort Lake ORV parking area we ran into the groomer. In all my years of sledding I can count on one hand how many times I was mad at seeing a groomer coming at me. I tried to pull off the trail and got stuck in the heavy snow as the groomer went by. Rick and Kevin helped me dig out and then had to get Mandalln out as she was stuck too. We jumped on 473 which was as smooth as glass, having just been groomed. We then took 470 and headed to the Cut River Bridge. We took the Cut River walking trail down to Lake Michigan which required moving about 50 downed trees to get to the lake. Once on Lake Michigan you can’t image the beauty of the snow in the trees. It was something to be seen firsthand. We took a break to admire the scenery, and then started back on #470 stopping for gas in Rexton. Buddy and I encountered several deer on the trail just before town. After gassing up we continued on trail #2 and into Naubinway. 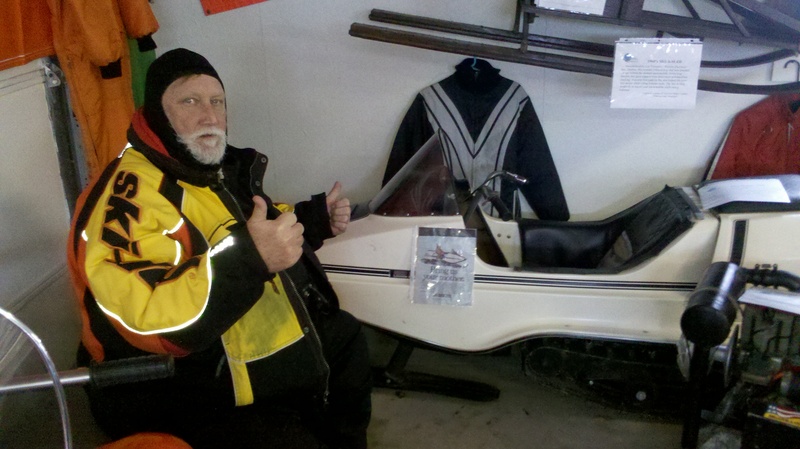 Everyone checked out the Top of the Lake Snowmobile Museum and relived those old glory years of days gone by. After a lunch stop at Shirley’s and seeing their snow monkey, which is the back end of a deer fluffed out. I try to take a different route every chance I get, when the option is there so we headed back on trail #2 to 470 which was in good shape for so late on a Saturday afternoon. When we got to where trail #470 meets up with trail #2 we met the groomer again. We made quick work of trail #470 with Buddy doing most of the driving then crossed over M123. We hooked back up to Trail #2 south on the railroad grade. We stopped again for gas at BP, with me hoping to ride tomorrow, then went back to the hotel. It was a great 145 mile day with no problems. When we got back to the hotel several of us stayed in the parking lot after loading up the sleds and talking. Carl had to leave early to head to Houghton in the morning. When I got back to the room I found out Mary, JJ and Jacob had executed their plan. They had gone and got decorations for Buddy’s big 10th birthday. I also got lucky because Jason went and picked me up some smoked fish from Gustafson’s Smoked Fish in Brevort. John and Geri Griffin returned to celebrate with us. We called BC Pizza for food and ate in the breakfast room that Mary and the kids had decorated for Buddy. Then there was cake, ice cream, swimming and socializing before bed. Sunday morning was a no ride day as Mary was still not feeling 100% but had been a trooper the whole weekend. We loaded up and headed home with happy kids asking if we could do it again next year.